MSG Network was rebranding their corporate image and on-air graphics package and needed a compelling online accompaniment for that effort that extended the brand and messaging and provided additional functionality not available within the confines of linear broadcast TV. As an embedded part of the MSG team, Omnigon has an intimate knowledge of the systems and cultures at MSG and was able to help define content strategy, as well as user experience. Omnigon’s extensive experience in systems integration, specifically content and video management, was invaluable to a project where thousands of hours of video content are the focus of the site. Omnigon developed the MSG.com site on a Java-based third party platform and insured that it tightly integrated with the video site it had deployed on behalf of MSG a year earlier. The value of Omnigon’s subject matter expertise around digital sports and media environments, especially those that must leverage third party feeds and the integration of existing systems, cannot be overstated. The ability for the Omnigon team to strategize on design approach and execution, provide high level systems integration and software development personnel, all while understanding the core sports audience’s expectations separates Omnigon from the rest of the digital development landscape. 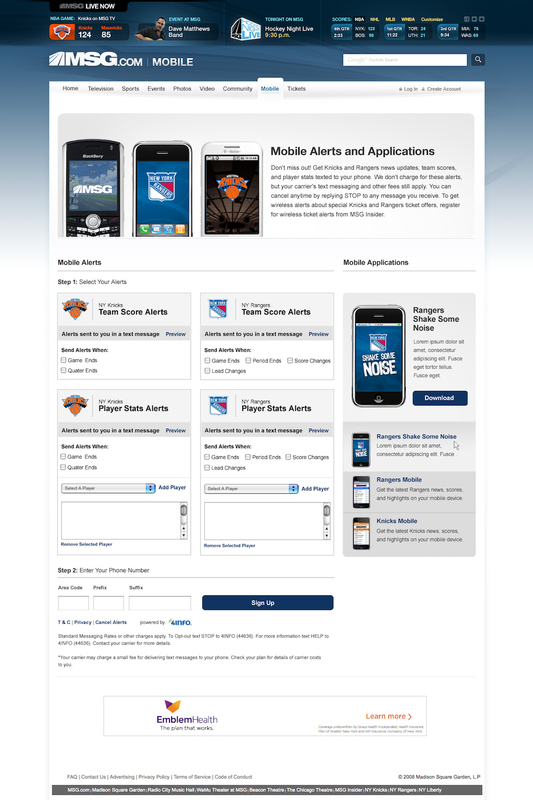 As a member of the Omnigon team, I worked directly with Madison Square Garden to help rebuild their site. My role as Senior IA & UX Designer was to help guide the client through the analysis, concept, wireframing and redesign process. MSG built the ultimate experience for the New York Sports Fan. We created their website. MSG + Omnigon. The perfect partnership. We delivered Digital/Content Strategy, User Interface Design, User Experience Design, Front End Programming, Systems Development & Integration. 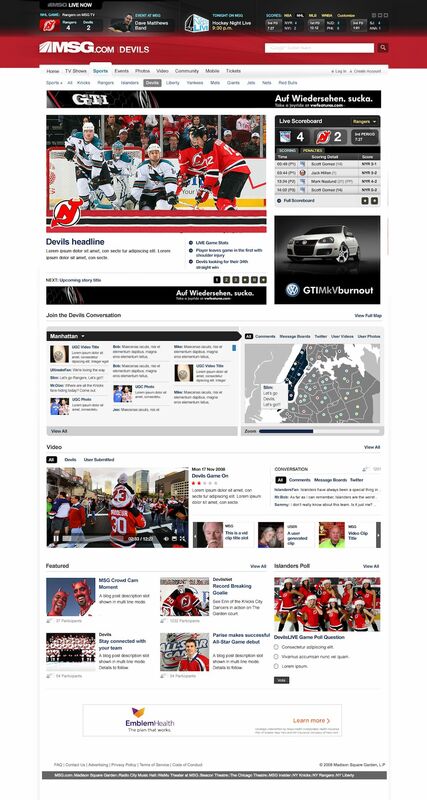 The new MSG.com boasts a sophisticated user experience that weaves into the visual story created during broadcasts. This allows network talent to “throw to” the web site and also have the web site provide consistent tune-in messaging while maintaining brand integrity. 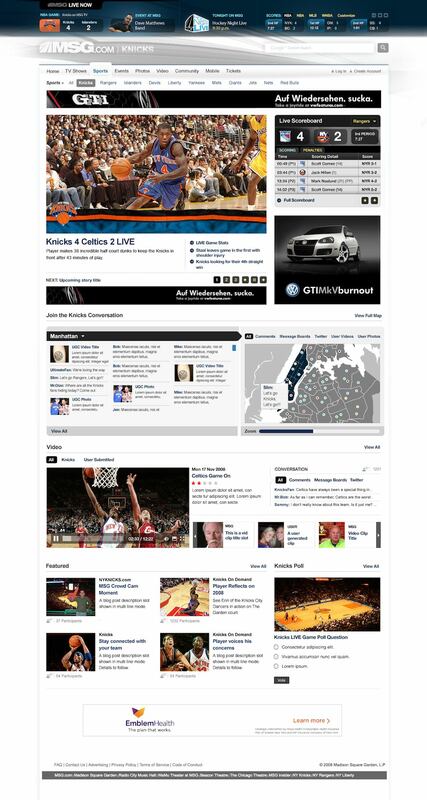 Additionally, the new MSG.com features the visualization of social media data in ways not available on other sports sites via the MSG Pulse product.